The Yankees' starting pitcher will be Luis Severino, who had a nice outing in last Wednesday's Wild Card Game, and Nathan Eovaldi, who pitched for the Yankees a couple years ago, will be going for the Red Sox. Q. Aaron, 7-0 at home in the postseason the last two years. How much of that success do you attribute to the, quote, unquote, "home field advantage," and what does it mean for your team to have these next two games here at your place? AARON BOONE: We definitely feel like here we do have a home field advantage. I think everyone's got to witness the impact I think our crowd's had on things. Certainly last year when I wasn't here, watching those games, actually doing the Wild Card game, but then watching those games on TV, the Wild Card game was a special environment, I thought, atmosphere-wise. Definitely gives us a home field advantage. And then the way our ballpark plays, I think we're kind of built for our ballpark in a lot of ways. Hopefully, we can continue to play well here. Q. When Hicks pleaded his case to get back in that lineup, what did he say to you, and what was your reasoning to him as to why it's not quite time yet? AARON BOONE: It was a really tough decision for me today, a lot easier the other day frankly, because today I felt like he is considerably better, and the way he was able to move around when Matt Krause was out there putting him through some extensive movements, felt like it was significantly better. He was more emphatic about wanting to be in there tonight. And I just felt like just with the nature of hamstrings sometimes and him being a center fielder and his legs being so important to him in the middle of the diamond, I just felt -- and the fact that we've got a guy like Brett Gardner as an option, I just really felt like not starting him tonight. Hopefully, it's something that benefits him even further. But that said, he is an active player tonight for us. I wouldn't hesitate to use him, not just in a pinch-hitting situation, but putting him in the game and feeling like he's ready to do that. Q. Aaron, why do you think Eovaldi was able to have such success against you guys late in the season? AARON BOONE: I think he was able to really execute his game plan, and he has really good stuff, obviously. We've seen the cutter for him become a major factor this year and become a really good pitch for him, to go along with, obviously, that high velocity. I felt like he's had really good command against us in those couple starts, kind of executed, throwing the ball where he's wanted to. So he'll be a challenge for us tonight, but I really feel like, if we can make him work, I feel like we have a chance to be successful. Q. Aaron, prior to the season, your introductory press conference you said you wanted to stress on communication and relationships with your players. As this season has progressed, how much of a challenge has it been for you as a first-year manager trying to cultivate and foster those relationships? Q. To try to foster and cultivate relationships with your players. AARON BOONE: It's been one of the best parts of the job, getting to know guys and trying to understand individuals and what makes guys tick. It's been one of the really rewarding things for me to get to know these guys because I came in with a high level of respect for a number of them. Their reputation kind of preceded them as us having a really good clubhouse and makeup in there, and that's all been confirmed for me. So it's been a pleasure to kind of get to know these guys and in some way become a part of their life. Yeah, I mean, it's been one of the best parts about doing this job is getting to know those guys in that room. Q. Using Betances a little bit lately as that guy to come out to relieve the starter. Is there something about him, his makeup or whatever, that suits him to that particular role in the playoffs? Do you expect to keep playing him that way? AARON BOONE: He's one of the best relievers in the game, throwing the ball really well. So any time there's a big spot or a part of the order that scares you a little bit, he's a guy I'm really comfortable giving the ball to. You could potentially see him in that kind of a role again tonight. You could see him later in the game. We'll just kind of try as best we can to come up with a plan, and then how Sevy's going and how deep he goes all factors into that. But he's certainly known as a guy that -- especially when it gets thick, we're very comfortable giving the ball to right now. Q. Aaron, when you have a starter going well like Tanaka the other night, how difficult is it to maybe fight your instinct to want to leave him in as opposed to going to the bullpen? And compare that to a similar decision in the regular season. AARON BOONE: The other night was fairly easy. I felt like, once he got through five and he was at that point in the lineup, where we were in the game, and how we were set up bullpen-wise, it was a fairly easy decision for me. And even the last inning-plus was a little more difficult for him. They started to make him work a little bit harder. So I felt like it was a pretty easy call for me and Larry as we sat there and worked through it, that that was the time to do it. And it is different than the regular season. There's no question about it. Generally speaking, especially when you have a bullpen like we do, during the regular season, there's nights when you're staying away from certain guys or you don't want multiple innings out of guys or because you're in an everyday mode. Here in the playoffs, you've got some off days built in so you know guys are able to recover and you're willing to lean on guys more. All that goes in, but it's definitely a little bit different than the regular season, I would say. Q. Aaron, if I could jump ahead to tomorrow real quick. Can you explain your thought processes in starting CC over maybe bringing Happ back after only 40-some-odd pitches, and if you were to lose tonight, could that change? AARON BOONE: I don't think so. We feel like CC physically is in a good place right now coming off a really good start at the end of the year. I feel like his knee is in a good place and feel like he's been pretty good when we've been able to give him that rest. So we feel like he's kind of lined up and ready to go for tomorrow. We'll feel good about giving him the ball. Then you could always get an all-hands-on-deck situation any one of these games that come up. So, no, we feel good about that decision. Q. Aaron, after all the games you played in your career and managed this year at Fenway, how were the last two games different in terms of the atmosphere, and what are you expecting tonight also? 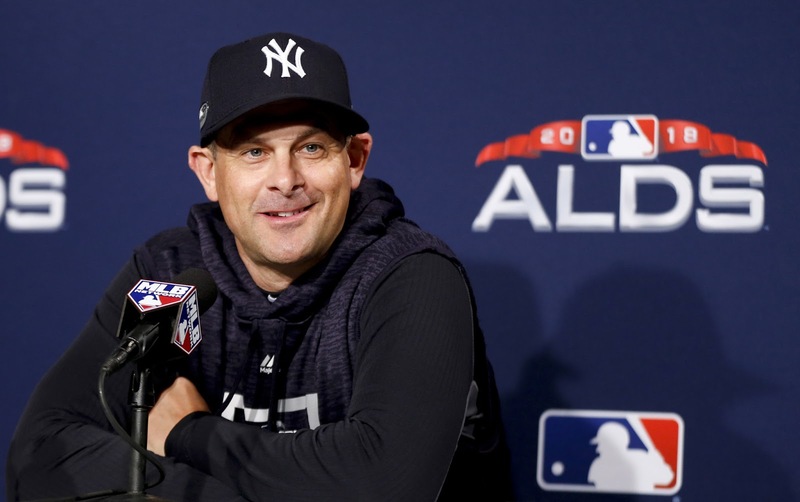 AARON BOONE: A little more on the line, but it's fun. It's a fun time of year. You're playing for a lot, and you put a lot in to being in this situation. So you kind of embrace that. As far as being at Fenway, I feel like the games we played there this year, because of both teams being as strong as they are, I think you definitely get a sense that the rivalry is in a good place, and that even the regular season games there this year, they all felt like a big deal. So those are fun to be a part of. And then tonight, I think it's going to be a special, special environment. Like I said yesterday, hopefully, we can go out and give them reason to even make it more of a home field advantage and a special environment. I know our fans are going to bring it. Q. Just going back to Dellin and you touching on all hands on deck, but he hasn't had too many instances this season where he's worked multiple innings. Is that a conversation you have to have with him each day before you kind of set a game plan? AARON BOONE: No. We check in, obviously, and see where he's at physically each day, how he's bouncing back, and then make those kind of evaluations as far as what kind of length do we feel like we have out of him? Obviously, his first two outings here has been two-inning outings around some off days. So we feel like he's in a pretty good place. But those are things that we get with each guy and see where they are, see how they're bouncing back, see when they go outside and throw where we feel like they are physically, and then we'll make those decisions as we go into a game, as far as is the guy available for one inning, maybe one-plus. Those are things that kind of unfold over the next couple hours, and then the game obviously dictates a lot. Q. Just following up on CC. A two-part question: How much rope do you give him as he's going through the second time he's facing the order? And number two, he was pretty definitive in here about saying he wanted to play next year whether it's with the Yankees or not. What do you look at his long-term future as being? AARON BOONE: I look at CC that can -- first of all, tomorrow, as far as how much -- I mean, it's a long time between now and then, and a lot can transpire. You don't know what tonight brings as far as how many guys you use for how long. All those things kind of go in and factor when you're making evaluations the next night about a pitcher. So it's hard to kind of answer that question now. As far as CC going forward long term, there's no question, to me, that he can pitch for more than just next year if he wants to, as long as his knee holds up. As long as his knee's healthy, I think he can be a successful pitcher for actually many more years if he really wants to. I think he's still that good and capable. It just comes down to the health of the knee for me. Q. Aaron, a first inning home run is never really defined as clutch, but can you see a certain impact when Judge has hit home runs twice in the postseason for you in the first inning? Is there a different impact of scoring in that manner as opposed to just scoring a run or two early in the game that you can see? AARON BOONE: Well, I'd say, I guess since the two games that he's homered like that have unfolded the way they have, yeah, maybe it's been huge. I don't know. I mean, to score first and get off to a good start is always nice. Especially going through these games and especially going through these games with the Red Sox, they feel like a heavyweight fight. Nothing feels safe. Nothing feels good enough. So it's always great, obviously, to get off to a great start. But you never know where these games are going to go. They're fun to be a part of. They're grueling to be a part of. I think, especially when both sides understand what the other side's capable of, it never feels like enough. Q. Aaron, with Stanton's first time in the playoffs and feeling that kind of pressure, with his personality, it seems like he's gotten through a lot of tough times here in the first adjustment. Are you confident with the way he is? Is he able to handle those kinds of ups and downs, even in October? AARON BOONE: Yes. I think he's totally equipped for this. And we're going to -- and with Giancarlo, the nature of sometimes when he doesn't get a hit or whatever, sometimes he doesn't look great necessarily doing it, but we also know he's always so close from being able to have a major impact in the game. But what he's shown me, without a shadow of a doubt this year, that he is so equipped to handle the ups and the downs and the daily stuff that goes on. I know he'll be prepared, focused, in a good place, and give himself a chance to be really successful. Q. Aaron, when Severino was on such a roll in the first half, it almost seemed like -- I don't want to say taken for granted -- but it seemed like there was just utter confidence that you were going to get whatever you wanted out of him in every start, seven innings or less if you wanted. You showed confidence with going with him in the Wild Card game. Has that feeling returned now? I know in the playoffs sometimes you're not going to go as deep with a guy, but confidence that you're going to get whatever you want or need out of him in every single start at this point? AARON BOONE: I feel great that he's pitching tonight and feel like some of the trials that he's gone through this year even more prepare him for these kinds of outings and these kinds of moments. I feel like the way he was trending, the way he started to throw the ball the last couple times of the regular season, and then obviously against Oakland, I feel like he's in a really good place right now -- physically, mentally -- and hopefully he can go out and set the tone for us tonight.